Here we show you how to go rock climbing without a rope or a mountain – this is also known as bouldering. Literally, this sport can be done almost anywhere you can find a vertical object to cling on to! Bouldering is a fun challenge, and as long as you don’t go high, quite safe. Find a large boulder, cliff or wall with lots of handholds. The challenge is to climb along at the same height without falling off. This is a really good exercise for arms and balance too. Amazingly, this is a great game to play in the city, especially on old buildings made of stone rather then bricks. Churches, city walls and banks are all brilliant. But don’t trespass, and don’t cause damage. If you can find a wall along a public footpath – perfect. The secret to success is very strong fingers and shoes that can help you stand on small holds. 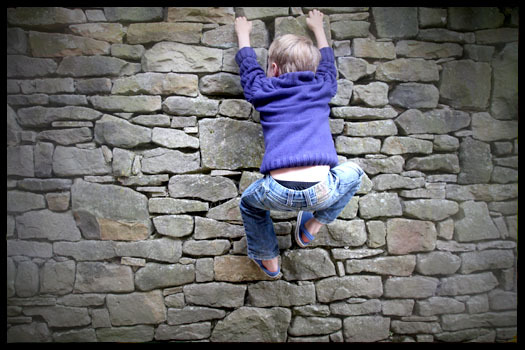 Additional ideas: if you find a really tricky section try and challenge your friends to find who can climb it. If you are finding it too easy, use a coloured piece of chalk to mark which handholds can or can’t be used. Try giving your knew routes ridiculous names. How to make a hollow tree den | Can buttercups tell if you like butter?